The police, yesterday, said they transferred the Senator representing Kogi West, Dino Melaye to the DSS clinic for further medical attention. This clarification dowsed speculations that the senator may have been whisked to an unknown location by masked policemen who stormed the police clinic where he was being given medical attention. Spokesman of the Force, DCP Jimoh Moshood, who disclosed this also revealed that the police in the meantime have obtained an order of court to keep Melaye in custody for 14 days while it continues with its investigation. Moshood added that Senator Melaye would be prosecuted along with other suspects on completion of investigation. He, however, observed that it was incorrect as reported in some sections of the media that Senator Dino Melaye was moved by masked armed policemen to an undisclosed location and that his whereabouts is unknown. 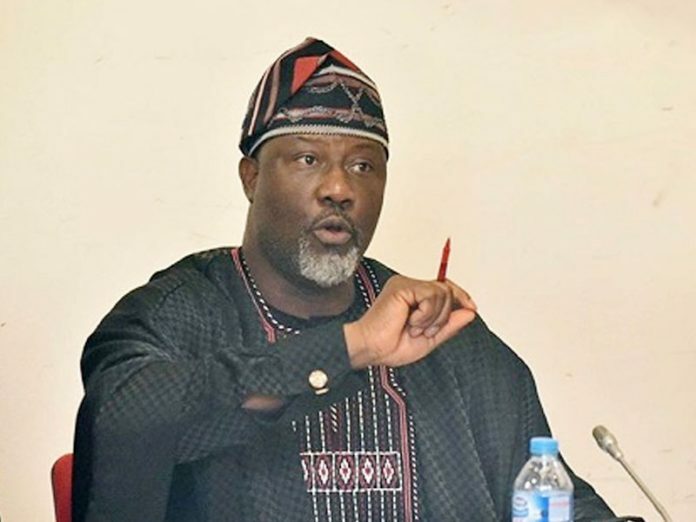 Melaye was admitted into the police clinic last week Friday after he surrendered himself to the police who had deployed heavily armed policemen to his residence in Maitama, Abuja, to effect his arrest over alleged attempted culpable homicide. The Kogi West Senator, who was said to be asthmatic, had at the police clinic complained of spinal problems along other issues but the police have continued to insist he was well and fit for arraignment over act of alleged attempted culpable homicide. However, information reaching THISDAY said masked security operatives stormed the hospital where Melaye has been receiving treatment in the last one week and took him away around 2p.m. yesterday. While one source said he may have been taken to Lokoja, capital of Kogi State, for interrogation over the alleged shooting of one Sgt. Danjuma Aliu by suspected thugs associated with the Senator, another said he has been taken to the Department of State Services (DSS) hospital. Though sources contacted at the DSS could not confirm if Melaye was at the DSS health facility. Similarly, police spokesman, DCP Jimoh Moshood would not pick several calls put across to him nor reply to text messages sent. Only few days to Christmas, Melaye had alerted the public through his Twitter handle of alleged plans by the police to arrest him and inject him to death but the police then dismissed the claim. The police subsequently deployed heavily armed personnel to his residence and vowed not to retreat until he surrenders himself to the Force for investigation of alleged attempted culpable homicide.